In 2006 the Housing Authority of Joliet purchased 64 acres of land near the SW corner of Briggs and Rosalind, Joliet. 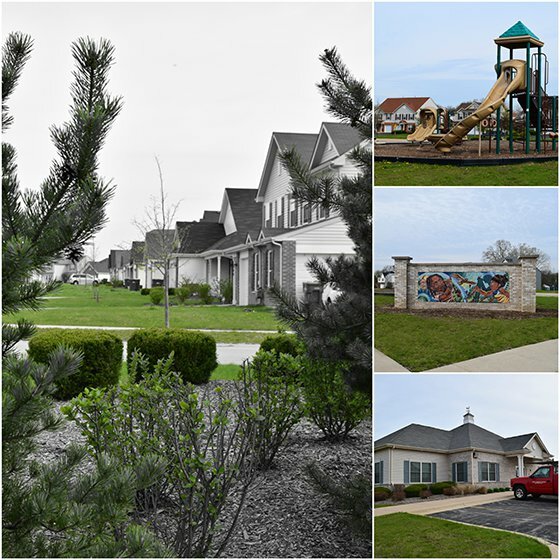 To date, we have developed 116 homes and a beautiful community. 4 units are targeted to families at 30% AMI. Construction completed on all homes March of 2009. Subsidized units: 63 homes are tax credit eligible. Of the 63, 17 homes have rental subsidy attached to the HAJ’s project-based voucher program. 5 units are targeted to families at 30% AMI. Project Based Vouchers / ACC units: The project received thirty-one (31) project-based vouchers and eleven (11) public housing units, to subsidize the rents of all families at or below 60% Area Median Income. Current residents can earn “good stewardship” credit applied against the purchase price of the home for maintaining a quality residence as a rental household and complying with all lease-to-own conditions in the Lease Agreement. Residences will be inspected quarterly each year during the compliance period. Residences passing the home inspection and compliance with all lease agreement provisions will be awarded a $500 credit per quarter or $2,000 per year to be applied against the purchase price or credited towards the purchase of shares into a housing cooperative either creating affordability per affordable housing guidelines. Reserve monies from the project will be available for use to assist in the lease-to-own down payment and closing costs (i.e. operating and replacement reserves will be made available to close any gap that remains). Security Deposit plus interest earned off same (minus required deductions) will be available for use to assist in the down payment and closing costs. Residents will also be encouraged to establish a homeownership savings account through the financial planning / management program to provide supplemental funds to use towards down payment and closing costs. In all, through the “Good Stewardship Program”, qualifying tenants will be able to finance the purchase of their home – in part – with the down payment and closing costs satisfied with credit and reserves earned under the lease program. Residents will also be offered training related to the on-going management of their homes and neighborhoods in anticipation of the purchase. The program will facilitate the sale of the homes at a price whose monthly expenses are projected to be less than the monthly rental payment in year fifteen (15). The master plan for Liberty Meadow Estates (the Briggs and Rosalind Site and the Poole Gardens Site) was developed over a six-month period with the input of various stakeholders, including; the Joliet Housing Authority staff, residents of Poole Gardens, County representatives, the City of Joliet, Commissioners, and numerous others. The Briggs and Rosalind site consists of approximately 51.08 acres of land and is located directly north of the Poole Garden site which accounts for an additional 12.9 acres of land. The combined total acreage for these two sites is approximately 64 acres. The master plan creates a series of new “grid-like” streets and parks that will ultimately weave together these two sites into one seamless sub-division. More specifically, the master plan includes a series of phases that will include a total approximately 168 new residential units. The 168 units will include a mix of duplex and single family homes, creatively spread throughout the entire site to integrate the units and not segregate them into clusters. Each unit will have its own front and rear yards. Duplex units that are located at a street corner will be designed to give each unit a unique street address and its own front and rear yard as well. A Community Association will be established and covenants designed to maintain the marketability of the community will be in place within all lease agreements or purchase contracts. The master plan also includes a new 3,000 square foot community building, strategically located at the edge of the existing Forest Park to maximize the programming opportunities between the Park Districts land and the new Briggs – Rosalind Homes Site. The community building was completed as part of Phase One and includes space for an on-site management office, fitness / recreation room, resident meeting / activities room, and maintenance storage. Management responsibilities are assumed by the Housing Authority of Joliet in partnership with Urban Property Advisors as the tax credit compliance agent. Finally, the plan is organized around a series of open spaces including “linear parks” and “pocket parks” containing playground areas, tot-lots, and amenities for people of all ages. The master plan has more than 5.5 acres of open spaces, which dramatically exceeds the existing zoning requirements. The open spaces are designed to have the maximum amount of visual surveillance by lining them with houses that front each park. This design feature for security is applied to the neighboring park to the west (Forest Park) by lining it with a public right of way and new homes as well. This design feature was well received by the Parks District as they too are looking to advance security for their parks through visual surveillance methods.